Mindful eating has come to the forefront of health and nutrition lately. It’s not always what you eat but how you eat that can make positive changes in your health and wellness. I can attest to this! I’m someone who’s tried every eating program, the newest fad diet and the oldest plan in the book. I’ve tried low carb, keto, gluten free, carb cycling, paleo and many others. What I realized is that figuring out what worked for me took much more than just experimenting with a new nutrition plan. It meant digging deeper to find out how I needed to eat versus what I needed to eat. We’re living in a world where we juggle family, partners, kids, work, a social life and so much more. We shuffle around all day from work meetings to playdates to carpool and taking clients out for dinner. We’re rushing through the day, rushing through conversations and definitely rushing though meals. It’s no wonder we’re not seeing results for our health, fitness and weight loss goals. We barely have time to think about what to order let alone eat in a way that truly helps us absorb our food. 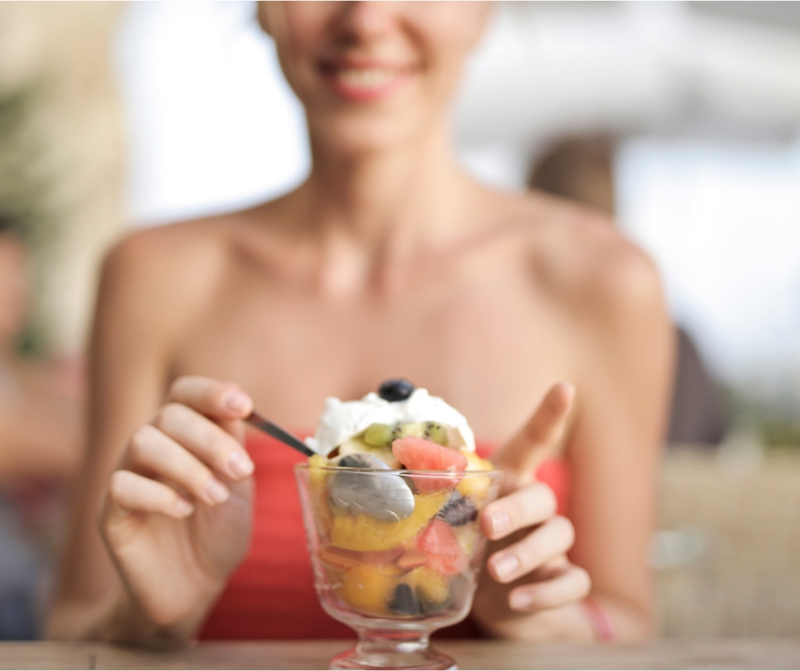 Luckily, there are some easy mindful eating tips that can help in any situation. Eating healthy isn’t really all that hard these days. Most restaurants and convenient stations offer healthy options of some sort. How we eat could use some work (for most people). It’s not just about eating a healthy balance of protein, carbs and fat. It’s about finding what works for you personally. Notice How You Feel – This is probably one of the most important, if not the most important part, to mindful eating. You need to notice how food affects you and how food makes you feel. A journal or an app on your phone that can track how food makes you feel is key here. Notice which foods, or combinations of foods, make you feel after you eat them. Does this food give you energy, make you feel sleepy or give you digestive issues? Energy, mood, and physical reactions in the minutes to hours after you eat can give you a lot of information as to how foods are working for you. Healthy Tip: Journal how you feel in addition to what you eat. It’s a great way to look back and reference what’s working and what isn’t. Our Balanced Eating Journal is a wonderful download to do just that. Eat Without Distraction – When was the last time you truly tasted the food you ate? Did you enjoy every bite? It’s so easy to get caught up in what you’re listening to on the radio or watching on tv that you barely acknowledge the meal you’re eating. It’s also easy to quickly inhale a meal while standing in the kitchen without ever taking a seat. How many meals have you eaten where you barely remember what you ate and if it even tasted good? I can honestly say that I’ve eaten way to many meals in my life and thought quickly afterwards that I had no idea if that food even tasted good – or if I tasted it at all. So why is this even important? Tasting your food is part of the digestive process. So when you start to chew your food, tasting it helps the salivary glands begin to produce saliva to break it down. Healthy Tip: Turn off or silence TVs, phones and radios. Connect with your partner or family (or friends) rather than mindlessly eating to the newest episode of your favorite show. You can do that after you eat. Chew Your Food Completely – I know you’ve heard this a million times! It kind of goes along with eating without distractions. When we are distracted, not only do we tend to taste our food less but we also inhale large chunks without actually chewing them. Chewing your food gives the saliva in your mouth a chance to moisten what you’re chewing and start the process of breaking down the food so you can actually absorb what you’re eating. It’s important. Your body has a much harder time digesting larger particles of food which means your chances of absorbing the nutrients out of it are lessened. So chew your food completely with each bite. Put your knife and fork down in between bites if necessary. Healthy Tip: Make it a point to chew your food until it’s almost a liquid in texture. Is is really hunger or just digestion? After you’ve eaten, there are many times where your stomach will rumble a little bit. This doesn’t necessarily mean you’re hungry. Digestion can produce movement and even sound which sometimes mimic being hungry. So you’ve got to determine whether or not what you’re feeling is true hunger or just digestion. If this is happening close to eating (within the first hour or so) then most likely it’s just digestion. If it’s happening hours after eating with real hunger pangs, then you might truly be hungry. Did you eat too little? If you’re hungry (I mean really hungry) 1 – 2 hours after eating, you may not have eaten enough. Or you might have eaten too many carbs and not balanced your meal properly with protein and fat. Either could come into play here. Did you eat too much? If you’re still full 4 – 5 hours after eating, it’s likely that you ate too much at your meal. You should be full after your meal but not to the point of unbuttoning your pants. You should feel satiated and that feeling should last until about 3 hours after eating. At which point, you might feel like you could eat a snack or something small but not another meal yet. Healthy Tip: Again, journal how you feel, your hunger levels and what you ate. Buy our Balanced Eating Journal download to help you track this type of information. Understand Food Is Inherently Good For You – We tend to beat ourselves up over every food misstep there is. Did I eat too much? Did I eat too many carbs? Was there too much sugar in that? Did I get enough fiber today? I ate white bread – oh no! I shouldn’t have eaten that cupcake. Stop the madness! Food is necessary for life. Food is good for you. <- Repeat those two sentences 5 times right now. I am in no way saying you should make it a habit of eating cupcakes for every meal. What I am saying is that it’s time to relax a little bit about food. It’s ok to have a treat here and there. Food is always fuel. While there are better choices than others, life isn’t going to destruct on the spot if you make an unhealthy choice. If you do misstep or you do eat something that didn’t make you feel good physically or mentally, don’t beat yourself up about it. Notice the feeling and figure out what you want to do about it going forward. Healthy Tip: Focus on what you do “right” in terms of healthy eating – not what you do wrong. Mix Up Your Plate – Part of mindful eating is paying attention to the nutrients you’re getting. We tend to eat the same things over and over again. This is totally normal and makes sense. We get into a routine and we find what we like to eat so we make these meals over and over again. They’re familiar. Giving your body the best nutrition means mixing up your food and getting in a vast range of nutrients. Think about colorful fruits and vegetables, a range of healthy fats – both animal and plant based as well as getting in protein choices that aren’t always the same. An easy way to do this is to take the foods that you normally eat and wither add or substitute with a new food. For example, if you’re used to making a salad with romaine, swap it out for spinach or arugula. If your mainstay protein is normally chicken, try grass fed beef or organic tofu. If you normally cook with olive oil, swap it out for coconut oil or avocado oil. You don’t always have to change the entire meal but maybe just an ingredient or two to switch things up and introduce new nutrients. Healthy Tip: Try to add one vibrant color food each day (in addition to greens). Portion Out Your Food – Rather than eating straight from the carton or container, portion out how much food you want to eat on your plate before sitting down to eat. So many times, we just eat out of the carton in which the food has been packaged in. Sometimes, it’s hard to know exactly what you just ate. Avoid this by actually using a plate and eating until you’re satisfied – not stuffed. And don’t feel like you need to clean your plate. The clean plate club is no longer the best option. Healthy Tip: Use your hand to portion out your food. This is perfect because you can do it anywhere. Protein is equal to the size and thickness of the palm of your hand, carbs are equal to a scooped hand, veggies are a clenched fist and fat is a full thumb. We’re all different and each one of us is unique. 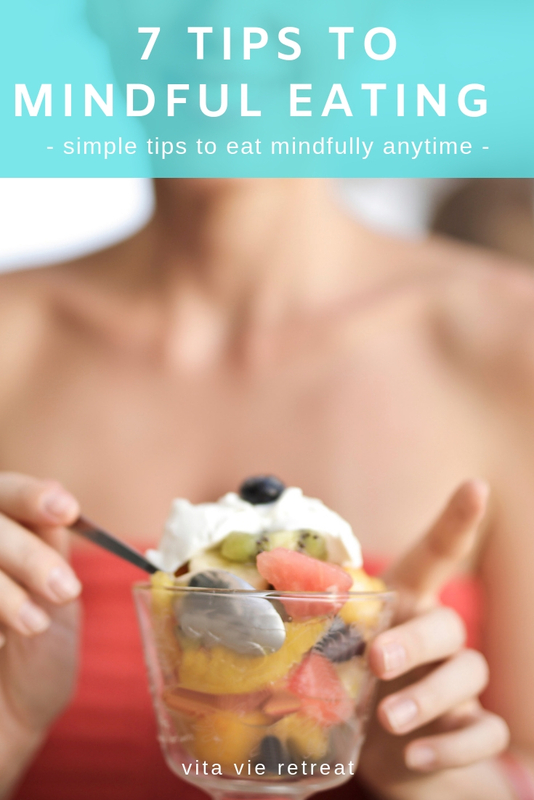 These tips are general tips that might make mindful eating a little easier for you or bring some helpful information to your attention. Most of us focus on what we’re going to eat, is it healthy enough and is it gluten free? What we fail to address is how we’re eating and whether or not that strategy is truly working for us. Join us for a fitness retreat to jumpstart your healthy habits! We offer group and private retreat programs in Delray Beach, FL to suit your needs. I hope you enjoyed this blog post. Please leave any questions or comments in the comment section below.